Nice Job Peter, Nathan, & BJ! Peter Plagenz, Nathan Boerneke, and BJ Otte, WLA Seniors, performed a TTB version of the Star Spangeled Banner for the WLA vs. Laconia HS football game on September 25, 2009. The weather broke just long enough for the National Anthem to be dry. Then the rains came! Everyone is invited to the WLA Chapel on Wednesday, September 23 at 10:00 a.m. where Republican Candidate Mark Neumann will be present to share his views and answer any questions regarding his campaign for Wisconsin Governor. Mark W. Neumann was born and raised in Wisconsin and has lived all his life in the great state of Wisconsin. Mark has been happily married for 36 years to Sue and is the father of three grown children, Andrew, Tricia, and Matthew. Mark and Sue are active members of Christ Evangelical Lutheran Church in Pewaukee, Wisconsin, and Mark serves on numerous synod committees. He is a past member of the Board of Regents at Wisconsin Lutheran College. Mark graduated from East Troy High School in 1972 and three years later from UW Whitewater with honors. While teaching mathematics at River Falls High School he completed his Master's Degree at UW River Falls. He then did graduate work at UW Madison leaving to manage a growing business. After teaching mathematics for four years at the high school level Mark and Sue started their business in the basement of their own home selling real estate. In 1986 they started building homes in the Janesville/Milton area. Four years later, after nearly failing in the first year, the company had grown to 120 homes per year providing job opportunities for over 240 families in southern Wisconsin. Over the years, Mark's companies received numerous awards for being some of the fastest growing in America. Mark left his businesses to run for U.S. Congress in 1991. After being defeated twice, Mark's persistence and fortitude resulted in a victory. On his third attempt, in 1994, Mark was elected to the U.S. Congress in Wisconsin's first district, becoming the first Republican to hold that seat since 1971. While in U.S. Congress his primary focus was on budgetary matters, serving on both the House Budget Committee and the House Appropriations Committee. Huge deficits loomed when he took office. Four years later the budget was in fact balanced and a surplus was being used to repay debt. George Magazine, one of many publications referring to Mark's role in balancing the budget, called Mark one of the most influential in Washington relating to this matter. It is out of concern for America's future, and Wisconsin's future in particular, that Mark is willing to leave the private sector and return to public office. He is committed to ensuring that his children and grandchildren have the same opportunities and quality of life here in Wisconsin that his generation has enjoyed. Luther's creedal hymn, We All Believe in One True God (Wittenburg, 1524) is in part a reworking of an older Latin creedal hymn which exists in variant forms in three manuscripts (Breslau, 1417; Leipzig, end 14th cent-beg. 15th cent. ; Zwickau, c. 1500). It's also a brand new recasting of the thoughts of that Latin hymn into separate stanzas for each of the three persons of the Trinity. Credo in deum patrem omnipotentem. I believe in God, Father Almighty. of the same nature as the Father. alle Ding stehn seim Gebot. schwere Pein des Tods der Ewigkeit. all things stand by his command. oppressive pain of eternal death. Why am I writing about this? Because I am preparing the Traveling Choir to sing Richard Hillert's setting of We All Believe in One True God (CPH 97-5500) for the 2009-2010 WLA Sundays. As I was doing my score study, I wanted to check that the words in the choral score matched Christian Worship 271. Well, most of the text was the same. Most, but not all. Every time I have my choirs sing a hymn in concert or in worship, I want them to learn the lyrics that they will continue to sing all of their lives, namely, the text that is in the hymnal. And the WELS hymnal is Christian Worship: A Lutheran Hymnal (NPH, 1993). "Made true man, our elder brother" and "Was crucified by sinful men." The reason the first phrase struck me was that the CPH version had "our human brother." It made me wonder what TLH had, and, lo and behold, it also had "elder". Now I was confused. Where did CPH get "human" from? It made me think of the CW translation of the Nicene Creed which included the phrase "and became fully human." Did the CPH text want to emphasize the humanity of Jesus to weigh in on the argument of "true God and true man"? What does it mean that Jesus is our "elder" brother – that he is the brother of all, the first and the last? And what about "by sinful men" or "for sinful men"? Neither one exists in the original German. Frankly, it seems much more Lutheran to say that Jesus was crucified "for" sinful men (meaning for all people of all times and ages) than "by" sinful men (would anyone not doubt that the Roman soldier were sinning by killing Jesus?). So if I had to lobby for one translation over the other, I'd go for "for". BUT IT'S NOT EVEN IN THE ORIGINAL GERMAN! So what's a choir director to do? Make my choir sing the CW 271 "translation"? Default back to the CPH version? Make my own translation? My gut says to go with the CW translation but to substitute "human" and "for" clarity (because how much is it going to screw up my choir student's brains to change two words in a hymn which doesn't get much play time anyway?). 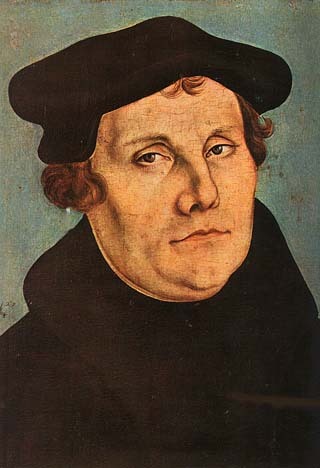 Actually, if I had my druthers, I'd retranslate the entire hymn to let Luther speak. This past week I received an invitation for the WLA Traveling Choir to sing as part of the opening service of the Northern Wisconsin District Pastoral Conference. The opening service is Tuesday, Oct. 27, 2009 at 9:00 AM hosted at St. Peter's Lutheran Church, Fond du Lac. Friday (9/4) 7:30 AM choir/brass rehearsal outside. Saturday (9/5) 7:30 AM warmups outside. 8:25 AM performance. Students should wear their WLA Winnie Lu Blue Crew t-shirts, WLA sweatshirts, WLA game jerseys, or any other blue and white WLA Viking apparel for the performance. This is NOT a dress up affair. We will NOT be wearing concert black and whites. Soccer and Volleyball players are excused from this performance because of their tournaments on that day. If a choir student cannot make this performance because of previous family plans, please send a note signed by mom or dad to me ASAP explaining why. Missing will NOT count against the student's grade unless they are not excused by written note before the performance.